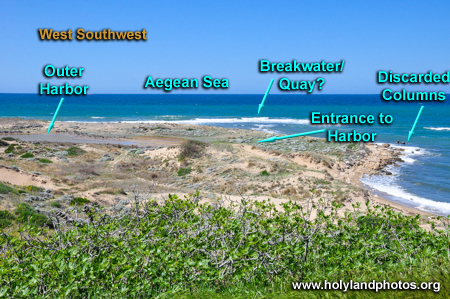 View looking west at the entrance to the Outer and Inner Harbors of Alexandria Troas. Part of the "Outer Harbor" is visible on the left side of the image. The entrance to the "Outer Harbor" is silted up with sand. The white waves outline where the sea breakwater, or possibly quay was located. On the right side of the images the tops of columns that were ready for shipment are poking up out of the water.